i-Series Plus is now compatible with method scouting systems. * Attaching a flow line switching valve allows up to six columns and four mobile phases to be switched automatically for analysis and to obtain optimum conditions for separation. Many i-Series Plus systems are used in manufacturing departments and other areas due to their simplicity, and performing method development with the same system improves the efficiency of method migration operations. 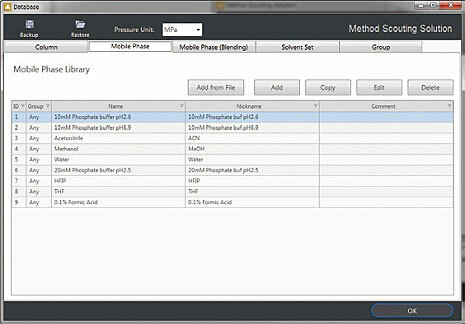 Preregistering the mobile phases and columns to be used can make it easy to specify method settings. In addition, the database includes a sort function that makes it easy to find the desired mobile phase or column even if a large number have been registered. 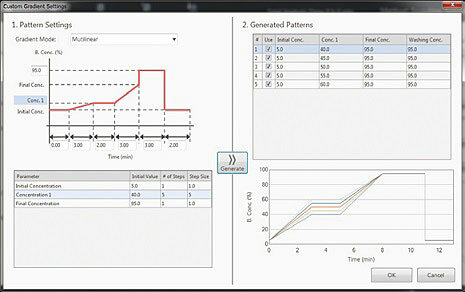 The estimated analysis end time is displayed based on the specified method and conditions being evaluated. Therefore, condition settings can be specified based on operating plans, such as by adjusting the number of samples or number of injections (both with a maximum of 10). An extensive range of gradient patterns, such as isocratic, multilinear, or stepwise, can be specified. Concentration conditions for specific locations can be easily changed and up to 100 gradient patterns can be evaluated. Batch files are created automatically based on the condition settings being evaluated. The created batch file can be edited before analysis starts, or analysis the analysis can be automatically started without editing the file. 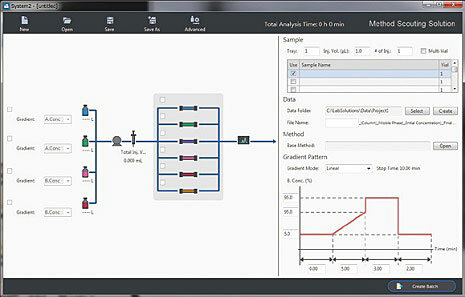 Processes performed after analysis can also be automated by specifying column rinsing and shutdown settings. 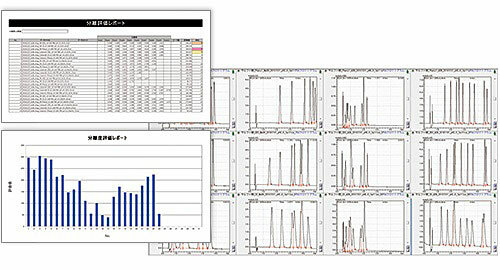 Data Browser can be used to display multiple chromatograms by simply dragging and dropping multiple sets of acquired data to the window. This enables quick comparison of the analytical results for more efficient decision-making. Using the multi-data report function improves the visibility of data when considering a large number of results. It can be used to compare a large number of conditions based on the same criteria, such as resolution and number of peaks, and then to assign values accordingly to determine the optimal conditions. Results for all the conditions considered can be automatically output as an Excel file, which provides powerful support for medium and long-term data management.